Donetsk: Soviet Historians' Association (Donetsk Branch) Publishers, 1992, Annaly, vol. 3. Chapter 1. Phenomenon of Alternativity: Some Theoretic Problems-12-75. Chapter 2. Objective Sociological Laws and Subjective Factor-76-108. Chapter 3. Historical Subject and Alternatives of Social Activity-109-131. Chapter 4. Genesis of Capitalism as an Alternative of Historical Development-32-164. The subject of this research is traditional in fact. Alternativity problem studied by the authors is nothing else but the old problem of free will. Fierce polemics on this issue have been going on for thousands years, at least since the times of Socrates In the frame work of certain system of notions the same problem may be formulated as an issue of social subject and objective sociological laws. Editor's Foreword the subject of the research is examined in the context of the process of replacement of the old general scientific paradigm (founded on the achievements of the 17 th-19 th cent. natural science) by the new one, which is being formulated in the framework of some scientific currents (the most influential one among them is Brussels School of Ilya Prigogine). The reinterpretation of the role and place of the alternativity phenomena in the world, the recognition of their essential significance represent an inalienable feature of the new paradigm. With respect to the problem of social subject the author comes to the conclusion that for the greatest part of the existence of the Mankind (primitive and archaic societies as well as early civilizations) the social evolution could be considered as a natural process governed by the logics of the objective sociological laws, where the role of subjective factor was minor. But later (with the accele-ration of social change, when the people began realizing the existence of a gap between due and real; with genesis arid institutionalization of different social ideals etc.) the significanse of this factor started growing. The qualitative break-through in this respect took place during the Axis-time (8 - 3 cent. A.N. ); since that epoch the social evolution of the Mankind cannot be considered as a completely (or almost completely) natural process. Social consciousness starts determining more and more social being. In Chapter 3 (Historical Subject and Alternatives of Social Activity, by Igor IONOV, Institute of World History, Soviet Academy of Sciences, Moscow) historical subject is considered in the light of activity approach reinterpreted by the author. He proceeds from the assumption that the attempts to explain the alternatives of social activity as a result of either solely external or exclusively internal determinations have proved to be unsufficient. Igor Ionov tries to overcome such onesidedness and to combine in his research both approaches. As he shows the antinomy of freedom and necessity (that becomes apparent in activity) may, be interpreted both 'materialistically' (as contradictory adaptive-adaptizing in relationto the environment character of activity) and idealistically (as a contradiction between value-oriented and aim-oriented types of activity motivation). The different combina-tions of adaptive and transforming, adaptizing sides of the activity phenomenon, valueoriented, aim-oriented and also consumption-oriented motivations of activity determine (in Igor Ionov's interpretation) the character of the concrete historical alternatives of various evolution. Chapter 4. (Genesis of Capitalism as an Alternative of Histo-rical Evolution, by Michael DMITRIYEV, University of Moscow, Faculty of History) deals with the mechanism of the formation of the alternatives of social evolution taking as an example genesis of capitalism in Europe. The author considers the cardinal dissimilarity of the European and Asiatic ways of social evolution as the most convicing confirmation of the existence and significance of alternativity phenomenon in history. 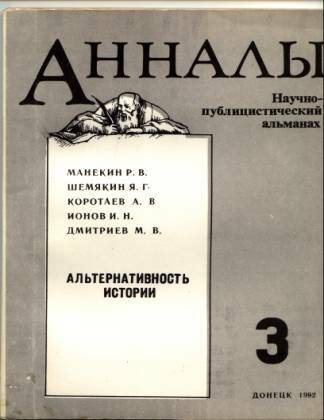 Alternativity of History (Editor-in-chief: Roman Manekin).Donetsk: Soviet Historians' Association (Donetsk Branch) Publishers, 1992.